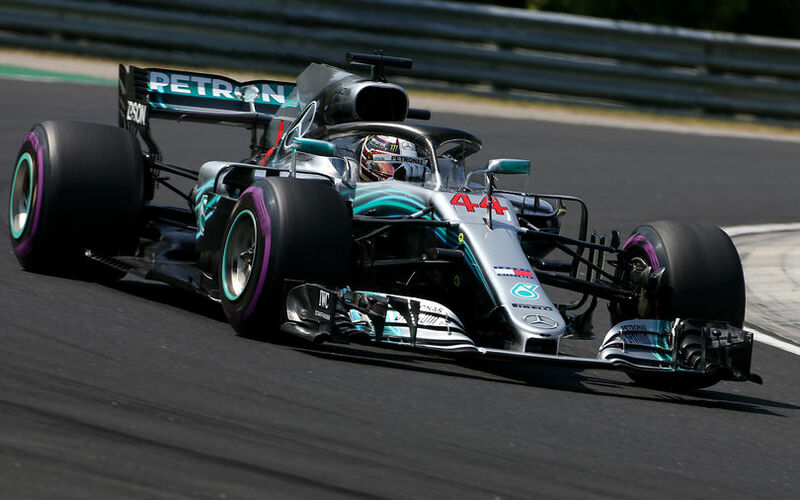 Lewis Hamilton controlled the Hungarian Grand Prix from start to finish, enjoying the protection of his team mate from a charging Ferrari duo. Bottas eventually failed to keep the Ferrrari duo behind on ageing tyres, allowing Vettel and Raikkonen to complete the podium. Thanks to a wet qualifying session on Saturday, drivers had a free choice of tyres to start the race. This is usual for cars that qualified out of the top 10, but this time around, the top 10 were free to pick their tyres as well. This liberty resulted in ultra softs for all top 10 starters, except Vettel and Sainz, who started from 4th and 5th. Out of the top 10, everybody began on the softs, except for Ericsson (ultra softs), Perez (ultra softs), and Stroll (medium, starting from the pits). As the lights went out, both Mercedes retained their front positions. Vettel moved up a spot into third at the expense of Raikkonen, who dropped to 4th. Verstappen moved up into 5th while Carlos Sainz had a difficult start and emerged 8th after the first corner. Sainz though did have a good getaway, but was squeezed by Vettel, and then saw Verstappen get pass through the inside of Turn 1, forcing him to back out of accelleration from that turn and allow Gasly and Magnussen past as well. Further back, Ericsson bumped onto Ricciardo's front wheel under braking, and later into a Force India as well. It all passed without retirements or obvious damage. For Leclerc, the race was done quickly as he came to a halt before completing the first lap. 5 laps later also marked the end of the race for Max Verstappen as he parked on the grass after reporting a "loss of power". By then, it was clear that Alonso was struggling to keep up the pace, with Grosjean getting past him on lap 6, and Ricciardo on lap 8. This left the Spaniard just ahead of Vandoorne after the Belgian had made a solid start. Another two laps later, Ricciardo progressed into the points by decisively getting past Grosjean for 10th. Ricciardo went on to pass Hulkenberg, Hartley and Sainz in the next 5 laps to get into 7th. On lap 14, Raikkonen is then the first to blink and stop for new tyres, changing to soft in a bit of a sluggish pitstop. The Finn returned to the track in 6th, midway in between Magnussen and Sainz. Mercedes immediately mirrored that move by pitting Bottas as well. The faster stop, and his on-track advantage allowed him to return to the track in 4th, ahead of Magnussen, but 2 seconds behind Gasly. By lap 20, both Bottas ans Raikkonen had gone past Gasly whereas Hamilton's 8s advantage over Vettel started to shrink down. On lap 25, the race leader eventually pitted from a 6.2s advantage. Hamilton came back out on track in second place, 13.5s down on new race leader, Sebastian Vettel. On lap 32, Gasly pitted and came back out on track still in sixth, just ahead of Alonso and Vandoorne. Both McLarens at the time had not pitted yet. At the halfway mark, with 35 laps of 70 done, Vettel had 12s in hand over Hamilton, and an extra 12s to Bottas. The latter was chased by Raikkonen for fourth while Ricciardo was on a slightly better pace 5th, 5s down the road. Gasly in 6th was 30s further down. On lap 38, Raikkonen pitted to take on another set of softs while Bottas set the fastest lap of the race thus far. Vettel pitted one lap later, taking on ultra soft tyres, but as the pitstop was a bit slow, he rejoined behind Bottas, who himself was 8s down on Hamilton at the time. Raikkonen on the other hand ended up 5th, 12s down on Ricciardo. Almost simultaneously, both McLarens pitted on subsequent laps. Both took on medium compound tyres and returned to the track in 8th and 9th. On lap 45, with 25 left, Ricciardo finally pits, changing his soft tyres that he had been using since the start of the race to new ultra softs. 19 laps from the end, Vandoorne came to a halt at Turn 1, having endured a gearbox failure when accellerating out of the final corner. A strong race hence came to an end for the Belgian, resulting in a virtual safety car for approximately 30 seconds. By lap 55, with 15 left to go, Hamilton had extended his lead on Bottas to 15s while Vettel continued to chase the Finn hard, but failed to really make a passing attempt. Raikkonen by then had closed in to 2.5s of his team mate, 18s ahead of Ricciardo, and another 31 ahead of Gasly. 3 laps later, Bottas had become a driving blockage for both Ferraris, as Raikkonen was getting equally anxious to get past the cars ahead of him. The pace of the three men at the time was a full second slower than what Hamilton and Ricciardo managed. On lap 65, Vettel finally made a move in Turn 2, after Bottas defended the inside line well through Turn 1. Vettel though seemed to aggresively turn into Turn 2, with Bottas still on the inside of the corner, and thereby clipping parts of the Mercedes front wing. Vettel was extremely lucky to get away without puncture there, with Raikkonen happy to stay out of trouble and follow through into third position. Bottas meanwhile dropped down until being just ahead of Ricciardo. The latter obviously didn't let that happen and tried to overtake the Mercedes on the outside of Turn 1. However, though Ricciardo took a wide line, Bottas seemed unable to turn in rapidly enough, and ran into the side of Ricciardo, creating damage to the Red Bull. Still, Ricciardo went on, and 2 laps later, he ended up under the rear wing of Bottas yet again. And indeed, Ricciardo made another move, and made it stick on the ultimate lap. Bottas again defended the inside line, but this time, Ricciardo opted to ease on the brakes and put everything on the accelleration out of the corner, a strategy that worked brilliantly against Bottas's old soft tyres. This eventually meant Hamilton enjoyed a straight forward victory, with Vettel limiting the damage in the championship by finishing second. Pierre Gasly sends Toro Rosso into the summer break on a high as Fernando Alonso gets another 4 points for McLaren.